It should come as no surprise that the restaurant at Emerald Lake lodge is often used for wedding receptions. This iconic scene offers a stunning reflection of the resort and the mountains that surround the lake. 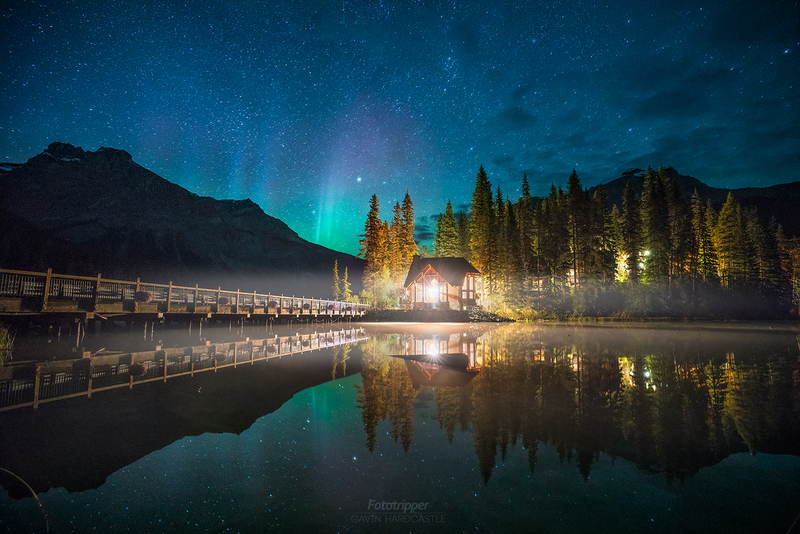 That night, the usual tranquility of Emerald Lake was transformed into a mini arena of classic anthems such as ‘Bohemian Rhapsody’ and ‘Sweet Home Alabama’. I’ve been after an Aurora over Emerald Lake for years. It’s a big hit on my Banff Photogpraphy Workshop and I can’t tell you how many times I’ve driven out there knowing there was an impressive aurora kicking off while sitting under a blanket of cloud and coming home empty handed. This night I got lucky. There were few clouds, no moon and I get there in plenty of time to catch some lovely light pillars in the North East. To ensure I didn’t miss the moment, I set my camera to time lapse mode. My Sony A7RII was set to take hundreds of 20″ exposures over a few hours and the frame you see here was the moment of most activity. The light show wasn’t quite what I’d hoped for but it was the best I’d seen at this location so I was happy with what I got. That doesn’t mean I’ve given up trying though. If the conditions are right I’ll be back out there to resume my hunt.